Set in the heart of Singapore’s downtown core—also the business, museum and luxury hotel district—Singapore Marina Bay is the fifth store Louis Vuitton has opened in the southeast Asian city-state since 1979. Much more than simply a point of sale, Singapore Marina Bay is a travel destination in its own right for a host of very good reasons. 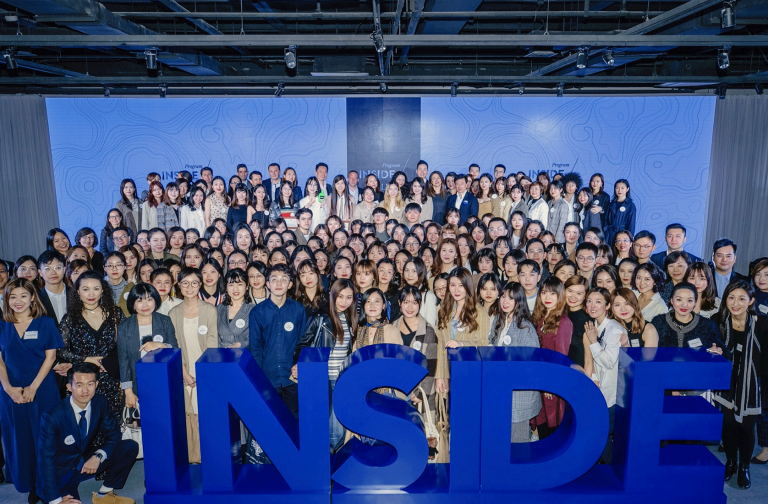 The first is a location in one of the world’s most dynamic cities and a prime economic and cultural hub of Asia. Second, it is an integral part of Marina Bay Sands, the ultra-ambitious architectural development designed by architect Moshe Safdie, most famous for its gigantic resort complex. 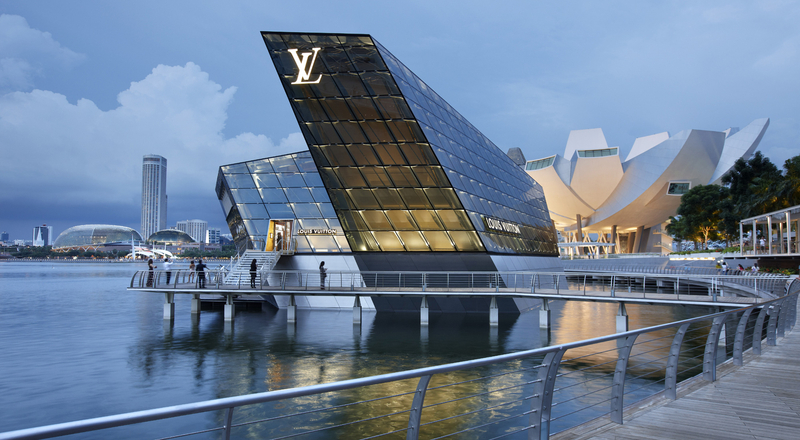 Facing this staggering feat of architecture and adjacent to the equally amazing, hand-shaped Artsciencemuseum, stands Louis Vuitton’s first island flagship store, inaugurated on September 18th, 2011. 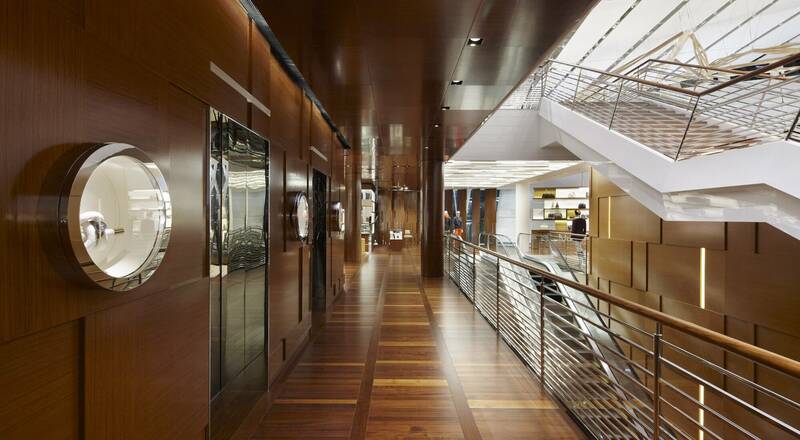 A “global store” that includes a rich cultural dimension, this new temple of luxury and art was designed by New York-based architect Peter Marino and Moshe Safdie. Hovering between sea and sky, it is a place unlike any other. Everything here echoes the world of the sea, the ubiquitous wood, metal stairways, an outdoor terrace reminiscent of an ocean liner’s deck, ropes, plus wide sails that shield the space from the glare of the light off the bay. And if its soul is oceanic, its architecture is too. 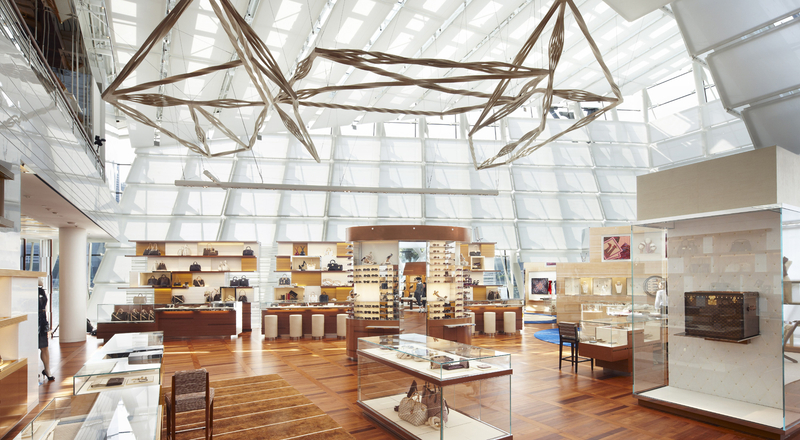 On the shore side, the first space is devoted to jewelry, watches, exceptional products and a bookstore. Standing proud on the foredeck of the vessel is a crystal pavilion reached by an underwater tunnel. In the daytime, the sleek glass façade affords a stunning view of the city and reflects the movements of the water. By night, it glows discreetly like a floating lantern. 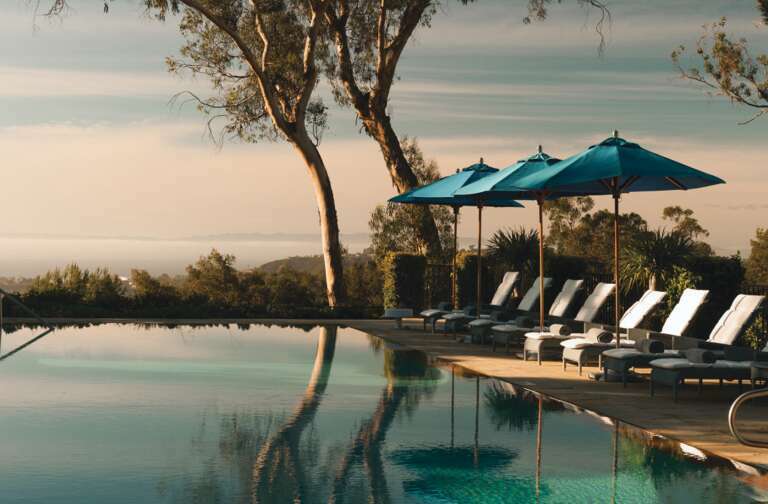 Art is a natural part of this exceptional location, like an invitation to travel. 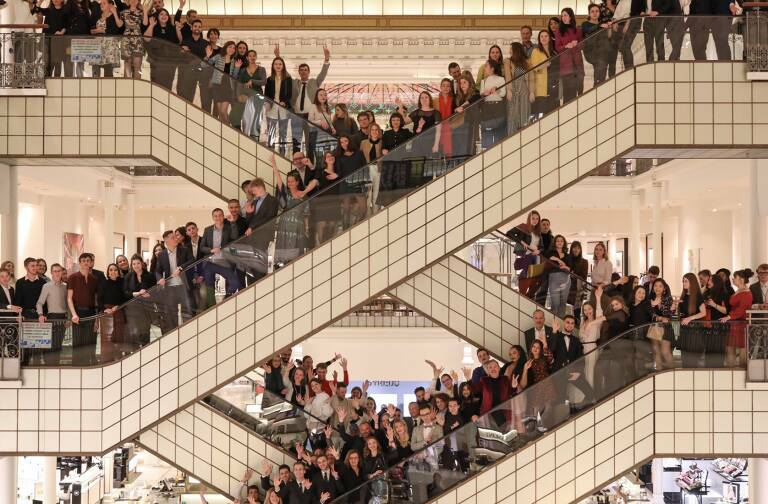 A magnificent suspended piece by Richard Deacon is the largest artwork ever made for Louis Vuitton. The bookstore is designed to intimate a cruise ship terminal, inviting browsers to cross the seas on a voyage of words. An all-encompassing mural masterfully recreates a watercolor by Ruben Toledo, depicting a place midway between the sea and the sky. On the wall, a video animation brings to life the famous Louis Vuitton bellboy, beckoning visitors to proceed through the tunnel, transformed into another art gallery. From stem to stern, Singapore Marina Bay is the ultimate temple of travel.